About this Virtual Run: There are 39 million blind people in the world, but 80% of blindness can be cured or prevented. Join the Eyes of the Dragon virtual 5k/10k/Half Marathon to support a charity working to prevent millions from becoming blind and restoring vision for others. Run or walk your chosen distance whenever and wherever you want to support the cause! 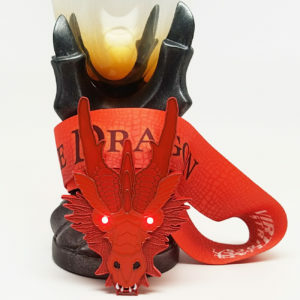 All participants will receive this amazing 4.5″ dragon medal, featuring glowing red LED eyes. About the Charity: Sightsavers is an international organization that changes lives for the long term, working in more than 30 countries to eliminate avoidable blindness and supporting people with visual impairments so they can live independently. Sightsavers is able to perform cataract surgeries for $50 and trachoma treatments for $11, can provide glasses for only $2, and is able to treat neglected tropical disease for a mere 11 cents per person, so your participation in this event will make a real difference for people in need! A portion of the proceeds from this virtual race (at least $5 from each registration) will be donated to Sightsavers. For more information about this charity or to make a direct contribution, please visit Sightsavers.org.